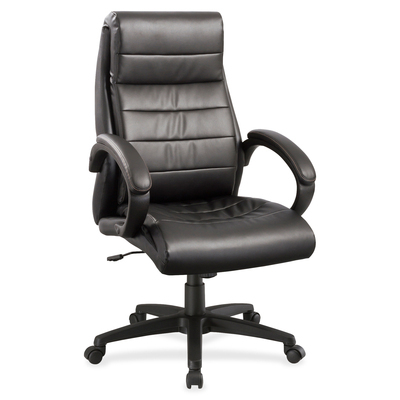 High-Back Leather Chair Offers Bonded Leather Back And Seat For Deluxe Comfort. Black Nylon Loop Arms Have Matching Arm Pads. Functions Include Pneumatic Seat-Height Adjustment, 360-Degree Swivel, Tilt, Tilt Tension And Tilt Lock. Black Nylon, Five-Star Base Is Equipped With Casters For Easy Movement..
High-Back Leather Chair Offers Bonded Leather Back And Seat For Deluxe Comfort. Black Nylon Loop Arms Have Matching Arm Pads. Functions Include Pneumatic Seat-Height Adjustment, 360-Degree Swivel, Tilt, Tilt Tension And Tilt Lock. Black Nylon, Five-Star Base Is Equipped With Casters For Easy Movement.